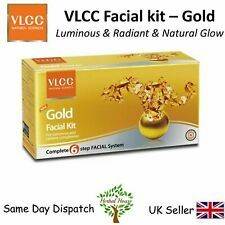 The anti-aging benefits of gold can be traced back 5,000 years to Cleopatra, who was said to sleep in a gold face mask every night to enhance the suppleness of her complexion and preserve its natural luminosity. 100% original and high-quality clinique stars of clinique gift set. 1 X Clinique Stars of Clinique Gift Set. Clinique smart custom - repair skincare serum perfect for reducing wrinkle and age lines. This clinique gift set includes. 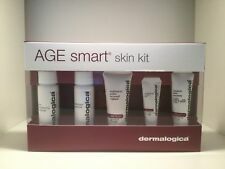 New Dermalogica travel gift set Skin Kit. Condition is New. UltraCalming cleanser, 50ml. UltraCalming mist, 50ml. UltraCalming™ Cleanser 50ml. UltraCalming™ Serum Concentrate 10ml. UltraCalming™ Mist 50ml. Our pictures are there for guidance that you are buying the correct product, not the correct colour. Keep out of eyes. Reformulated with 40 per cent more vitamins than before, it’s Olay’s simple, smart approach to younger, healthier-looking skin. Defies seven signs of ageing for younger, healthier looking skin every morning. Made with intention to help combat the onset of ageing, this serum pairs two of my favourite essential oils of Rose and Frankincense and a little drop of geranium as well as a collection of other lovely natural ingredients. The composition of the cream is based on as many as three natural extracts strengthening the walls of the dishes: extracts of chestnut, beetroot and cranberry. Redblocker cream for vascular skin for the night. All you need to look gorgeous when you're travelling in fact! If Carling made travel kits etc etc. the kit contains. Clean Skin Scrub 25ml. Vitamin E All Over Body Cream 50ml. Facial Sponge. Skin Treat Collection. For normal to dry skin. st Class: £ FREE! 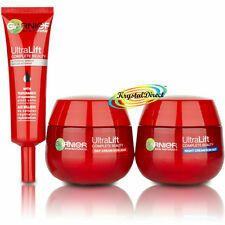 Give your skin a boost with UltraLift's triple action formula -. Garnier UltraLlift - Intensive Serum 30ml. Garnier Ultra Lift Complete Gift Box Set. Once emptied the jar also looks lovely with a tea-light in it . Kimono Doll Lip balm Gift set. Containing 3 x Kimono Doll Lip balms. A clear sealable pouch decorated with Kimono Doll design. Design: Novelty Japanese Kimono Doll. Lip Balm Specifications. Apply UltraCalming Cleanser to dry or damp face and neck, and over closed eyes with circular motions. Rinse thoroughly or tissue off. Spritz UltraCalming(tm) Mist over face and neck, with eyes closed. The history of whoo Gongjinhyang seol radiant white skin care kit 5tems samples. Suitable for dry, normal and oily/combination skin types, Omorovicza’s Ultramoor Mud Mask will transform your complexion within 15 minutes – firming, smoothing, clarifying and illuminating with a cocktail of the finest, skin-nourishing ingredients. Lines, fine lines, improve skin gloss. 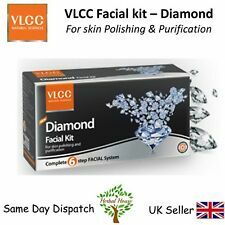 dry skin, help to improve the appearance of fine lines, etc. Omorovicza Budapest Introductory Gift Set Worth £120. New boxed. New Boxed Dermalogica. Hysro- Active Mineral Salts (Sample). Kit includes. CLARINS 4 PC BATHING BEAUTY SET With Summer fast approaching, this 4 pc Clarins set makes the ideal gift. Containing 3 of Clarins top scents suitable for the bath or shower all beautifully presented in this season's iconic floral make-up/wash bag. Included in the set is - Eau Shower Gel Eau des Jardins Uplifting Shower Gel Eau Ressourcante Bath & Shower Milk. A beautiful Clarins floral make-up/wash with a ball & charm zip pull. Featuring UltracCalming Cleanser, UltraCalming Mist, UltraCalming Serum Concentrate and Barrier repair, these four products work in tandem to leave skin feeling nourished and protected. R10 Labs Mens Christmas Premium Skincare Gift Set - NO WRAPPING NEEDED! R10 Labs Valentines 5 Item Premium Natural Skincare Gift Set NO WRAPPING NEEDED! 12 Concentrated Botanical Extracts including Brazillian Copaiba, Myrica Gale and Katrafay to energise & revitalise your skin. This Valentines, let us take the hassle out of gift giving. Just like our skincare, it couldn't be any easier. R10 Labs Mens Birthday Premium Skincare Gift Set - NO WRAPPING NEEDED! R10 Labs Valentines 3 Item Premium Natural Skincare Gift Set NO WRAPPING NEEDED! 12 Concentrated Botanical Extracts including Brazillian Copaiba, Myrica Gale and Katrafay to energise & revitalise your skin. This Valentines, let us take the hassle out of gift giving. Just like our award winning skincare, it couldn't be any easier. Alluring Oud Wood Aroma. Suitable for all skin types. Made in England. Prunus dulcis, Vitis vinifera, Natural Vitamin E, Oud Wood Extract, Aloe Vera. This kit will keep your beard conditioned and shiny and our Organic Beard Soap will keep the beard clean. A Total of £33.00 of Liz Earle product. Instant Boost Skin Tonic 50ml [RRP £6.50]. New unused. Perfect xmas gift for her. The shave cream soothes and heals the skin for a more comfortable shaving experience, this product contains Kale Extract which is a rich source of Beta-Carotene, Vitamin C, K, B, Iron, Calcium, Magnesium, Manganese, Copper, Potassium and Antioxidants. THE HIGH FLYER. VITA LIFT 5. Microdermabrasion Rejuvenating Puffs Refills. Neutrogena Microdermabrasion System Neutrogena Logo. It also contains glycerin to help condition the skin as it exfoliates. 4 Weeks: 88% had significantly reduced appearance of wrinkles or age spots. The Admiral Nourishing Beard Oil can be used as a beard or pre-shave oil. Why did we choose to include Olive Extract in this product?. Olive has been known to be an incredibly useful ingredient for skincare for many years. Skin Type Mature Skin. Contains: Skin Resurfacing Cleanser 30ml, Antioxidant HydraMist 30ml, MAP-15 Regenerator® 0.5g, Dynamic Skin Recovery SPF30 10ml, MultiVitamin Power Firm 5ml, MultiVitamin Power Recovery® Masque 15ml, Renewal Lip Complex (sample). Eight hour cream - Original Skin Protectant 15ml. Eight hour cream - All Over Miracle Oil - 100ml. This is an amazing gift set for anyone who uses Elizabeth Ardens Eight 8 hour skincare range. The set comprises of. Formulated without artificial fragrances, colors or parabens. What makes Scent Warehouse so good?. Huge savings - We have a dedicated team who are constantly monitoring our prices. This kit will keep your beard conditioned and shiny and our Organic Beard Soap will keep the beard clean. Established in 2017, McAniis product line was designed for the discerning individual who gives consideration to their grooming and skincare.